This beautiful, extensive villa is situated in a very private, gated community of only four villas. It is located in the prestigious Verdemar area, which is an extremely pleasant, well established residential area of Villamartin, and adjoins the Villamartin Golf Course. It is a very spacious property with 3 beds, 2 bathrooms (one en-suite) and is fully equipped and furnished to a high standard. It has the luxury of providing a wonderful private pool just a few steps from the terrace - swim or relax around the pool in complete privacy, a car port, air-con (in all rooms) which is a must in the summer months, an elevated outside dining area, first floor solarium and roof top terrace offering superb views out towards the coast. Although in a quiet area, there are bars, shops and restaurants just a 10min walk away. Perfect holiday villa for the whole family, a 2min drive to the Villamartin Plaza, 5min drive to the beautiful, white sandy beach of La Zenia. Torrevieja with its marina, restaurants, bars, shops and Water Park is a nearby drive away. Features include alarm, cable TV, air-con, DVD/PlayStation 2 console, CD, WiFi, Table Tennis. Villamartin Plaza: The central Plaza of Villamartin is renowned for its abundance of bars and restaurants serving a variety of international cuisines such as Italian, Chinese, Argentinean, Thai, Mexican, Swedish and English and is on two tiers, with a beautiful courtyard in the centre. The Plaza also has a small supermarket, a bank, a chemist, a doctors, gift shop, etc. and is a 2 min drive from the villa. Next to the Plaza is the Villamartin Golf Club, which is equipped with tennis courts and a clubhouse restaurant, which is open to the public for lunch and dinner. Beaches: The Costa Blanca is renowned for its abundance of beautiful white sandy beaches, many of which have been given a European Blue Flag rating. The nearest is La Zenia, which is only a 5 min driveway, Cabo Roig, Dehesa de Campoamor and Mil Palmeras which are within a 10 min drive away and have a gentle sloping sand into the warm sea - ideal for families. Pedelos and water sports can be found at some of the local beaches. If you fancy a drive out, North of Torrevieja are the beautiful beaches of Guadamar which is bordered by a large expanse of sand dunes covered with pines and eucalyptus, La Marina and La Mata. The resort: The Costa Blanca enjoys a mild climate with year round sunshine. The World Health Organisation recognise it as one of the healthiest areas in the world due to its salt lakes! Torrevieja is only a 15 minute drive away and is a typical Spanish seaside town, where you will find Spanish restaurants and bars, a marina with boat trips and fishing trips available, an evening 'craft market' and fair along the sea front, a local waterpark, go-karting track, cinema, indoor bowling alley and an outdoor shopping complex 'La Habanaras'. Locally, you need never go hungry or thirsty as there are many restaurants and bars that can easily be reached on foot or by car. For golf enthusiasts, the villa overlooks the 17th hole of the Villamartin golf course, for non-golfers there are beautiful beaches to explore, water sports, local street markets selling delicious fresh local produce, horse riding, local Spanish towns and villages to visit or simply while away the day by relaxing by the pool. We have been renting and sharing our home in the sun for over 10 years, we love it here. We love the sunshine, local healthy climate, white sandy beaches, Spanish way of life, tapas, cervezas, you name it. Elevated balcony for alfresco dining. Solarium on first floor level provides bistro table and two chairs, and two sun loungers, for even more secluded sun bathing. Fabulous views overlooking the Villamartim golf course at the 17th hole; perfectly positioned for playing golf. Very private pool, not overlooked, with nobody to share with except your own family/group. Roman steps lead into the shallow end. Sun umberalla and 6 sun loungers are available. We can also provide the following: Welcome Packs - a selection of essentials including: tea, coffee, milk, sugar. We can also provide baby items, e.g. cot, pushchair, highchair, etc. to hire. Costs for welcome packs and/or baby items are payable locally in Euros on arrival. For rentals of 10 days or more, a fresh linen service is available. This is an extra cost and can be booked through our Local Rep. Towels are provided for indoor use only. 1 bath towel per person. Please provide your own beach/pool towels. Pool lights are not available in the pool. Please note that smoking is not permitted. We stayed in September and found the villa to be spacious and well set out. We made full use of the pool even though the weather was a bit changeable while we were there. The villa is well placed for the bars and restaurants nearby , no more than a 15 minute stroll to the main strip. We liked the idea of secure parking behind the electric remote controlled gates, no worries about car theft and damage. The air con is metered but the charge seemed very reasonable even though we had to have it on for spells during the nights due to the heat. We are only a couple and only used the downstairs but there is plenty of room for larger groups. All in all a good villa to stay at. Lovely villa, in beautiful surroundings! We stayed in Villamartin as a family of five, (all adults). The villa was in a lovely location and gave us more than we expected. The villa was well positioned, equipped and maintained. Everything was in good working order, clean and comfortable. The owner, (Jude), and her managing agent, (Julie), were both really professional,helpful and friendly, and provided us with lots of information, regarding the local area and details about the villa. Both were also very quick responding to any questions we had. Restaurants, bars and supermarkets were all in walking distance and there was much to explore, both on foot and in the car. We loved the weather, beaches, bars, and everything this area had to offer, and have no hesitation recommending this villa as an ideal place to stay for your holiday! Excellent location very clean villa and the kids loved the pool. Ideal for a group of golfers. We went in January, so not the warmest time of the year to visit Torrevieja. Once we had sorted out the Air Conditioning to warm the Villa we were very happy. The local golf courses were excellent and that's what we were there for, so all good. 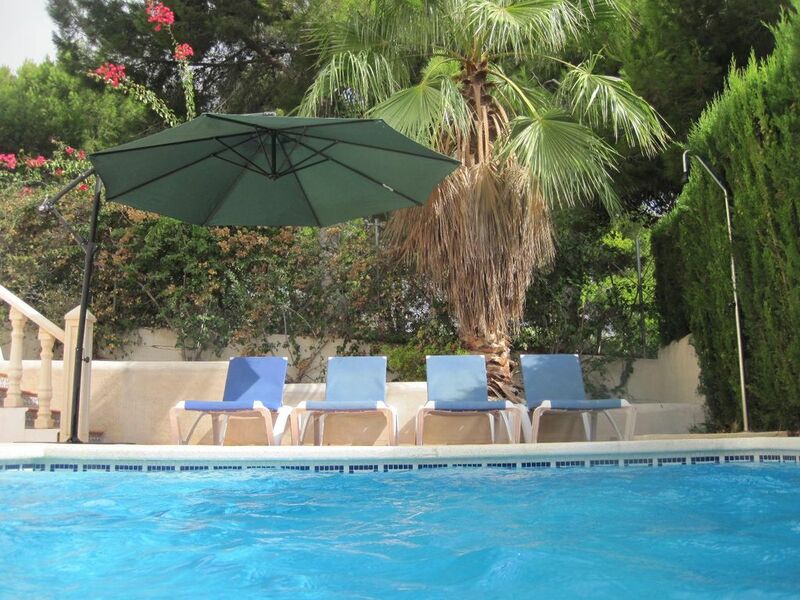 Villamartin is situated approximately 12 km west of Torrevieja on the Costa Blanca. It is approximately a 45 minute drive from Alicante Airport and a 25 minute drive from Murica Airport. There are several blue flag beaches within the area providing clean and safe bathing. The villa has beautiful marble flooring throughout and consists of three twin bedrooms, all with built in wardrobes and air-conditioning unit in each room. To the ground floor is master bedroom with en-suite, dining area, lounge with sofa bed for two people, kitchen, utility room and Wc. From the lounge patio doors is an elevated outside dining area. To the first floor level there are two twin bedrooms, master bathroom and door leading to solarium. Steps from the solarium lead up to roof top terrace. Golf: Villamartin is without doubt one of the finest golf courses on the whole of the Costa Blanca. It has hosted the Spanish open in January 2000 and is a frequent venue for the Mediterranean Open. The course is varied and not too long, and is well adapted to the natural surroundings and terrain. It is open all year round and ideally situated adjacent to the property. (As quoted in The Golf Mag Europe, Summer 08 'at the 17th you will find the signature Par 3 220m elevated tee to a tier green - superb').The contrasting courses of Las Ramblas and Campoamor, set amongst incredible water hazards, pine & palm trees are within a 5 min drive, (take plenty of balls with you!). The famous two 18-hole Kentucky blue-grass courses at La Manga are accessible via a 35 min drive south. The relatively new PGA course 'La Finca' is about a 15 min drive away. Please contact us for useful phone numbers for checking availability.